Certified Information Security Manager (CISM) is a professional certification sponsored by the Information Systems Audit and Control Association (ISACA). Candidates for the certification must meet requirements set by ISACA. The CISM certification has been renowned as the globally recognized achievement for those who have experience managing an information security program. 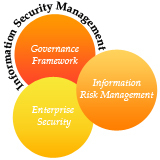 CISM is a unique credential in information security as it is designed specifically for individuals who have experience managing an information security program. These areas and statements were developed by the CISM Certification Board and represent a job practice analysis of the work performed by information security managers as validated by prominent industry leaders, subject matter experts and industry practitioners. Gain a better understanding of information risk management. Provides the information security professional with an opportunity to build upon existing credentials and provides tangible evidence of career growth. Recognition of attainment of advanced job skills as required for an information security professional. This workshop is meant for professionals responsible for managing, designing and overseeing an enterprise’s information security. The CISM certification would immensely benefit those aspiring to make a career in Information Security Management. The CISM workshop covers 5 information security management areas outlined by ISACA. Each information security management area has a set of review questions followed by a mock exam on completion of the workshop.